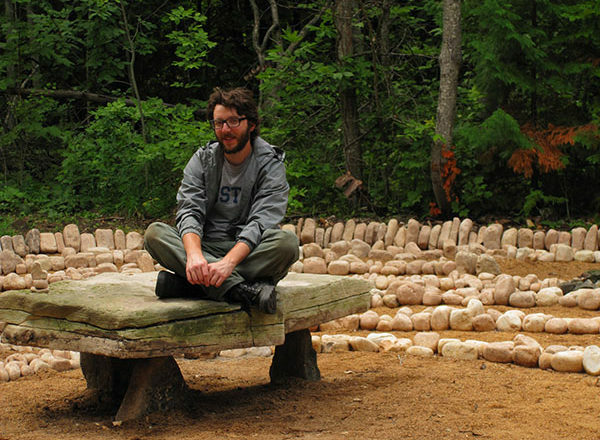 Nate Bond sits on the Nordic bench in the labyrinth he built in 2012. Submitted. At a place established 83 years ago by Jens Jensen – one of the most important landscape architects in American history – in large part as a training ground for young landscape architects, it’s fitting that The Clearing has continued this tradition. To that end, for the past nine years, a first-year student in the University of Minnesota’s three-year graduate landscape architecture program has been hired as an intern to work at The Clearing for the summer. Even before we began our summer landscape intern program, The Clearing had a long history, post-Jensen – he died in 1951 – of introducing landscape architecture students to The Clearing, an important part of Jensen’s legacy. 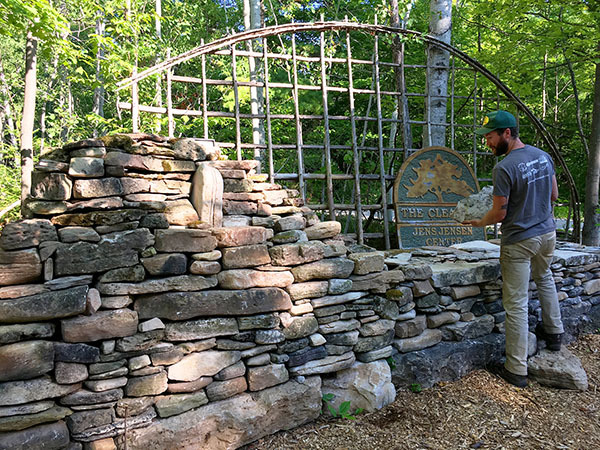 Will Linscott, The Clearing’s 2018 intern, works on the stone wall on Garrett Bay Road at the driveway entrance to the Jensen Center. Submitted. Starting in the early 1970s, when Darrel Morrison began bringing his University of Wisconsin-Madison students to The Clearing, and continuing to this day, many landscape architecture student groups have come to The Clearing, usually in spring, before our season of week-long classes begins. Typically, they are here for a long weekend, spending one day doing landscape-related projects and another day discovering, absorbing and enjoying The Clearing. During their stay, they learn about Jensen’s vision for this magical place and gain an increased appreciation for the profound impact he had on the art of landscape architecture and on the early land conservation movement. Through the years, students from several universities have been introduced to The Clearing by way of one of these spring weekends, including University of Wisconsin – Madison, Purdue University, Iowa State University (The Clearing’s Assistant Director Erik Rinkleff, who has worked at The Clearing for 20 years, was one of the Iowa State students in 1994), South Dakota State University and, last but not least, the University of Minnesota. Along with Erik, who has had such a profound impact on The Clearing, the groups of students and faculty from the University of Minnesota have had the most significant and long-term impact on The Clearing, not only by virtue of the many fine landscape projects they’ve done, but also by virtue of the relationship that has developed between the university and The Clearing with the summer landscape intern program. 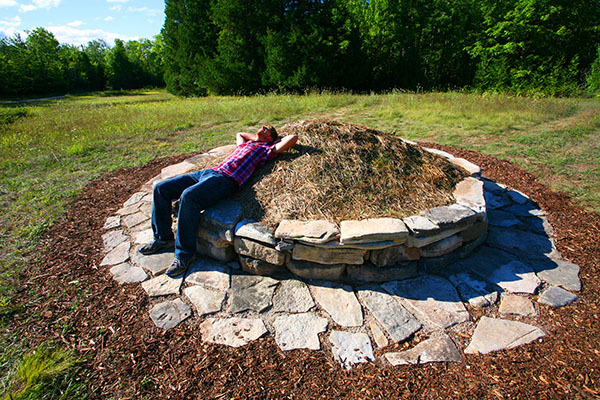 Cort Eidem, The Clearing’s 2011 intern, at the completed stargazing ring. Submitted. In 2010, after 10 years of spring visits, and after an already strong relationship had developed between The Clearing and the University of Minnesota’s Department of Landscape Architecture, the two institutions agreed that The Clearing would hire one first-year graduate student each year to work on landscape-related projects during the summer months. Since then, in addition to lending a hand with a variety of much-needed landscape maintenance tasks, including helping with invasive plant control, many important landscape-related projects have been done by our University of Minnesota summer interns. These include the Lodge and Schoolhouse meadow renovations in 2010, the star gazing ring in 2011, the labyrinth in 2012, a flagstone terrace and stone wall on the west side of the Lodge in 2016/2017, several new hiking trails created in the past five years, a retaining wall near our new blacksmith forge building in 2017 and five small flagstone terraces outside dorm rooms, also in 2017. Will also completed a large stone wall at the new entrance to the Jens Jensen Center on Garrett Bay Road, a project started by last year’s intern, Isaac Hase-Raney and designed by Erik Rinkleff. And Will did several native plant landscape plantings at the Jens Jensen Center, worked on the landscape in the new parking lot at the Jensen Center and has done much work on our ever-expanding and increasingly important invasive plant control program, working on eliminating forget-me-not, dame’s rocket, valerian, white sweet clover, creeping bellflower, helleborine orchid and everlasting pea. The Clearing’s landscape interns have left a lasting impact on The Clearing and The Clearing’s landscape, continuing a legacy of helping to train and influence young and aspiring landscape architects through hands-on learning, which was started by Jens Jensen in 1935. And from what our interns have told us, The Clearing has left a lasting impact on them. We hope that impact follows them through long and productive careers in landscape architecture. Peninsula Arts and Humanities Alliance, Inc., which contributes Culture Club throughout the summer season, is a coalition of nonprofit organizations whose purpose is to enhance, promote and advocate the arts, humanities and natural sciences in Door County.